After making a batch of big, soft, ginger cookies and admiring the lovely cracks and crevices, I decided to try converting my ginger cookie recipe to chocolate chip. It took a little experimenting, but I finally got what I was looking for — a dense, chewy cookie with a deep brown color and a top with big craters. These are very good jumbo chocolate chip cookies (although I cheated and used chunks). Chips or chunks will do. The key to the great texture is using an egg yolk instead of a full egg, adding 2 tablespoons of molasses and using a generous amount of baking soda, which makes the cookies rise quickly and crack. I also used a lot more vanilla than usual, and the cookies tasted great! Definitely not too vanilla-y, which was a concern. Maybe the vanilla and molasses kind of balance each other out? I don’t know, but it worked. These do have more of a molasses flavor than average chocolate chip cookies, but not so much that they’ll remind you of spice cookies. Also, I used Brer Rabbit Full strength molasses. If I’d used mild molasses, I would have ended up with less molasses flavor. But I liked these and wouldn’t change them! They’re big, flashy and perfect for bake sales. They also do NOT require any electric mixers, which is a big plus in my book. 2 cups large bittersweet or dark chocolate chips or 2 large bars 60% cacao chocolate, cut into chunks. Note: Chunks of chocolate may cause more spreading, so I recommend chips for the first batch. Melt the butter in a microwave-safe bowl. Let it cool for 10 minutes. In a large bowl, mix together the egg, yolk, both sugars, molasses and vanilla. Add the cooled butter. Stir flour mixture into sugar mixture until thoroughly combined. Stir in chocolate chips. Scoop dough (about 1/4 cup -- but it's not precise) and shape into 16 equal sized mounds. If you have a scale, each dough mound should weigh about 2 1/2 oz. Place shaped mounds on a plate or tray, cover and chill thoroughly for at least 3 hours (overnight is best). Arrange dough mounds about 3 inches apart on a baking sheet that has been lined with parchment paper. Bake at 350 degrees F. for 13 to 15 minutes or until cookies appear set, nicely browned and cracked. If cookies spread a little, push the edges inward using the tip of a spatula so that they're a little more rounded. Let cool on the baking sheet for about 10 minutes, then transfer to a wire rack and let cool completely. I like to put mine in the refrigerator to set the chocolate. Consider the amount of chocolate a suggestion, but in my opinion these are best when you really stuff them to the max with chocolate. They expand quite a bit in the oven, so if it seems like you've added too many chocolate chips or chunks, you'll probably be happy with the finished product. The recipe does not double well. The mollases gives these a great flavor! I added some almond slivers to my batch. This is the second time making these. A crew of 4 ate all 17 in under 2 hours. Thanks for testing it with maple syrup. I’m definitely going to give that a try! They were perfect! The recipe yielded 17 big cookies and they are almost gone already. They couldn’t even wait for them to cool. They baked for 14 minutes and came out thick and chewy with just the right amount of spread. They look just like the picture aside from the chips and the added walnuts. Thanks for the recipe, this is going to be my new go-to! Jade, I’m looking forward to hearing how they turn out. This recipe is funny in that the cookies come out flat for some and puffy for others. It will be interesting to see how maple syrup works. If you end up not loving these for some reason, I recommend the Big Flat Chocolate Chunk. I’ve been making them a lot lately and really love them. But these are good too — or should be. I mixed the dough for these earlier and the mounds are chilling now. I didn’t have molasses, so I substituted an equal amount of maple syrup. I have no idea how that’ll affect the taste/consistency. I also replaced 1/2 c of chocolate with chopped walnuts. Aside from that, I followed all the other directions, using chocolate chips instead of chunks. I’ll be baking them for my crew at the fire station later and I’ll be back to let you know how they turn out! I will say, the dough looks perfect and was very easy to handle and scoop! Glad you liked the flavor, but sorry to hear the cookies spread. I haven’t had that problem with this particular recipe, but when it comes to cookies you never know. What brand of flour did you use? Shortening could help, but for this recipe you really shouldn’t need any. Did you use “generous” tablespoons of molasses? Maybe it was the brand and amount of molasses. Some brands might be heavier and sweeter which would cause spread (more sugar = more spread). I’m just brainstorming because these shouldn’t spread too much. What’s funny is that someone else mentioned hers didn’t spread at all. It’s always interesting to see how recipe vary from one kitchen to another, but it would be fun to nail down exactly why the cookies didn’t turn out the same. I’ve tested so many chocolate chip cookie recipes that I really didn’t want to try another one, but I needed a cookie recipe the other day that was quick and easy and your molasses ccc’s were exactly what I was looking for. I’ll have to try with ones with roasted flour….I’m intrigued by the roasted flour! Thanks for pointing the recipe out. I love trying something new! Thanks so much for trying them! I appreciate the fact you took the time to post a review. If you get a chance, try the Chocolate Chip Cookies with Roasted Flour! Also, I still use your peanut butter cookie recipe :). Glad to hear from you. A further comment to my review. I was in a rush when I made these and did not have time to chill the dough mounds for 3 hours or longer. I put them in the freezer until they were solid, approximately 1 hour, and then baked them. The long chilling time shouldn’t be a deterrent from making these delicious cookies! The next time I make them I’ll sprinkle some coarse sea salt on the tops. Excellent! I’ve tested over 200 chocolate chip cookie recipes and this is definitely one of the best so far. The molasses add a bit of interest to the taste and a moist chew to the texture. I used coarsely chopped 70% chocolate and did not have a problem with spreading. My cookies were only marginally thinner than the ones pictured with the recipe. I subbed bread flour for 1 cup of the all-purpose, used dark brown sugar instead of light, and added 1 tablespoon of molasses, but doubt that these minor changes drastically affected the end result. A single recipe yielded 12 big cookies. Five Stars. Hands down the best chocolate chip cookies we have ever made! Our family and friends love these cookies. Thanks Anna for sharing your recipe! Hooray! Glad you liked them, Christine. This is one of my personal favorites because I like the hint of molasses. Thanks for the review! I’m so happy you and your family liked them. Sorry yours didn’t spread as much as mine. It could have been the flour. I find that unbleached flour spreads more. Also, if you didn’t weigh your flour your cups could have been a little heavier. But I’m glad the cookies were good despite the lack of spread. These are fabulous cookies! I have made them twice now and they turn out beautifully cracked and delicious. I make them with regular semi-sweet chocolate chips and a little smaller so they make more cookies, but otherwise follow the recipe exactly and they are sooo good! This is my go to chocolate chip recipe from this point forward. Thanks for sharing the recipe! Thanks for the feedback, Renee! I like this recipe a lot, too. I just made a batch of chocolate chip cookies using another recipe, but I wish I’d used this one. Just made these and they were fantastic! I used chocolate chips and they came out perfect!! These look great – I love molasses! No, I’m glad you were honest. But they should have been thick, so I’m not sure what happened. Even when I use chocolate chunks, I still get thick cookies. Weird, because I’ve made them about 4 times now. I didn’t put the weight of the brown sugar in the measurement because I didn’t think it would matter, but maybe you packed it in the cup a little more than I did? Or if you used dark brown sugar, that could have caused a little more spread. Oh sorry. I didn’t mean to mess up the star rating. Mine were pretty thin, so it must have been the chocolate. Next time I will try that tip of smushing them inward. I only ate one, because I gave the rest away (shoot!). So I will make them again and let you know if they turn out thicker. Thanks! Thanks for the review? Did you leave a star off because they spread? Mine spread a tiny bit when I used chocolate chunks instead of chips, but when that happened I just pushed the edges inward with a spatula to make the cookies rounder. I’m going to go ahead and add that tip to the directions. Using chopped chocolate instead of chips does cause a bit more spread, but the cookies should still be thick. Right now these are my favorite chocolate chip cookies. I like them better than the CI version because of the molasses. I am really sorry you had to leave off a star, but glad you liked them. I made these yesterday. They were very good, kind of reminded me of CI’s perfect CCC. I used chocolate chunks from a Trader Joe’s dark chocolate bar. I was only able to let them chill for 6 hours but next time I would probably freeze before baking because the did spread quite a bit. Mine were chewy and packed with tons of chocolate. I saw this post yesterday while sitting by my Moms hospital bed. I was kind of wishing for one and a cup of tea. I’ve never put molasses in a CCC. It’s a good idea to get that style of cookie especially with your leavening and vanilla tweaks. I like that the cookies are big and chewy! It’s been a while since I baked some chocolate chip cookies, time to make some. Thanks, Anna. Yum! I always want to eat chocolate chip cookies! I use dark brown sugar in my cookies because we like that molasses flavor. Fun experiment. Might have to try those, see what the fam thinks. oooh!! Yum, these look delicious!! Love the secret molasses and I’m a huge vanilla fan – will have to print and try!! Thank you!! 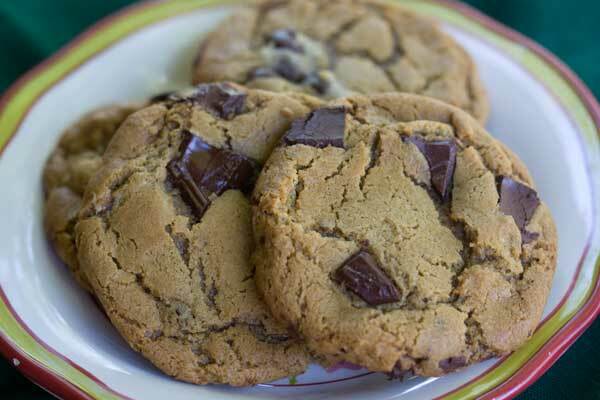 The picture made me want to reach through the screen and take one off the plates…and this is from someone who chocolate chip cookie is not in the top 5 of favorite treats. These look really good! I’m interested in the soft ginger cookies, too!